Here's an update on what has happened over the past couple of weeks of my time as a Cast Member. Yes, I visited the competition and I was very impressed overall. At work's Committee d'Entreprise they sell tickets to many establishments at a discount. Gate price for Parc Asterix is €46 with some days being discounted to €32. The day I visited would have been full-price but I got in for under €32 with the ticket from work. 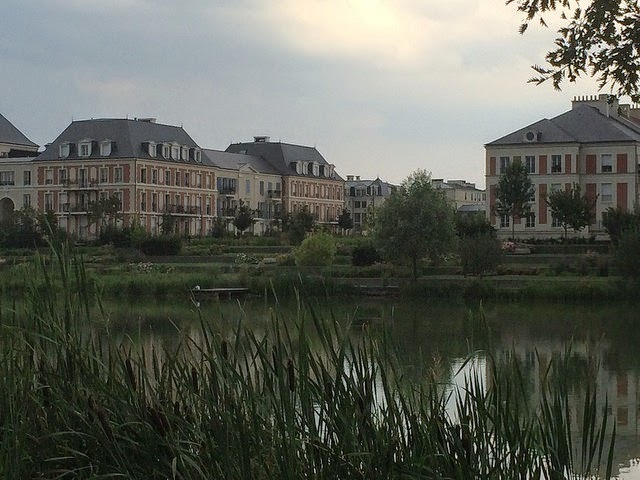 2) From Marne-la-Vallee-Chessy take the RER A to Chatelet-Les Halles and change for the RER B. Get off at the first airport stop (Terminals 1/3). The best value option is to purchase a Mobilis day ticket for zones 1-5 which costs you €16,10 and allows you unlimited travel all day on all forms of transport. When you get to the airport you will need to take a shuttle which again costs €8.50 return. Total journey time: 2h15-2h30. It was funny to see how few staff they have at the attractions with many rides being run by on person. I notice the lack of staff measuring guests at the entrance to the rides - you measure yourself and it didn't seem to me like they measured people at the ride stations but that was just my experience. It is also not possible to know how long a queue is before you enter it as there are no wait times posted outside the attractions which I found strange. Safety if course didn't seem as up as it is at Disney but then again I'm biased. To find out wait times for attractions you can download an iPhone app but this only shows the waits for the big rides so you'll know the waits for the rollercoasters and water coasters by using it. It's good that it exists but it'd be nicer to have all the rides on there or even more simply to just have electronic waiting signs on the outside of each ride. 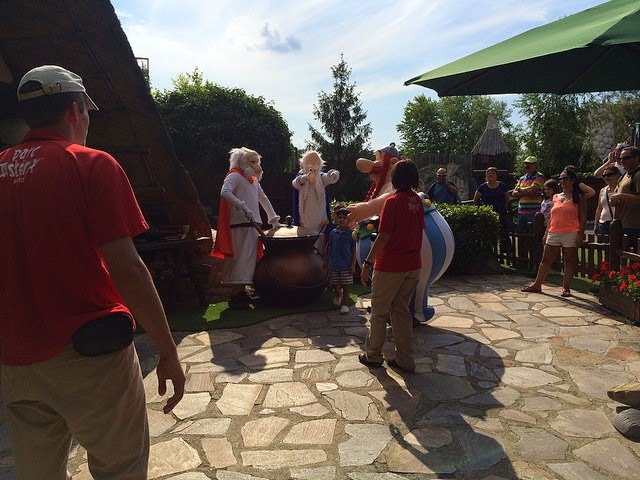 Parc Asterix characters - Look! No queues. The characters were all in one area which we stumbled upon by complete accident but when we did get there there weren't any queues - we waited a couple of minutes to see Obelix and Asterix himself had the same wait. There were a few others characters just walking around. They were all very good at being in 'character' which was great. This is a great change from the wait times to see characters at Disney which can literally easily top an hour! The park has three water rides which were great on a hot day - I'll be honest none of them get you soaked. You'll get wet but it's not on the scale of Tidal Wave at Thorpe Park, or Jurassic Park at Universal Orlando. The log flume (Menhir Express) is the best and wettest of the water rides - Grand Splatch fails to live up to its name however. Parc Asterix was generally very well themed on the outside of the buildings which I appreciated but then most of the ride queues were boring and non-immersive with next to no theming. The park had plenty of classic amusement park style rides as well as bigger coasters. OzIris the newest coaster is absolutely amazing with 5 inversions. It also has a very well hidden single rider line located by the exit, to the right - use it and the wait will be less than 5 minutes. In total I rode it three times and I could have done it a few more easily. I was really excited to go on Tonnerre de Zeus, my first wooden coaster, and I was thoroughly disappointed - it had the longest wait of the day at 40 minutes and it was so, so, so rough that it genuinely hurt and me and my friend just said 'Ow' all the way round. Goudurix has 7 inversions and is a steel coaster and is also very uncomfortable but not quite to the same extent as Zeus. Le Défi de César is described on Wikipedia as a 'mad house'. It is the oddest ride I have ever been on - it is interactive at the start, has an odd pre-show with a rotating room and an animatronic, it has a room where water jumps about for no reason and then at the end you're suddenly in a ship that goes "upside down" using the same ride system as Hex at Alton Towers. I really enjoyed this last bit - it was a very strange but fun sensation. It was by far the oddest ride I have ever been on and I seriously did not get the storyline bit it's worth a visit. Transdemonium was also an odd one - it a haunted house ride which is just strange with no storyline and terrible/non-existent scares throughout. It's worth going on for a laugh but it won't scare you. There are several shows throughout the day (hey, listen up Disney) and I can recommend the stunt show which retells the tale of the theft of the Mona Lisa - I didn't personally watch the others. There's plenty of rides for smaller children too. It was nice to do some big rides again after having got used to Disney's more tame coasters. The food was good - it was still expensive but less-so than at Disney. 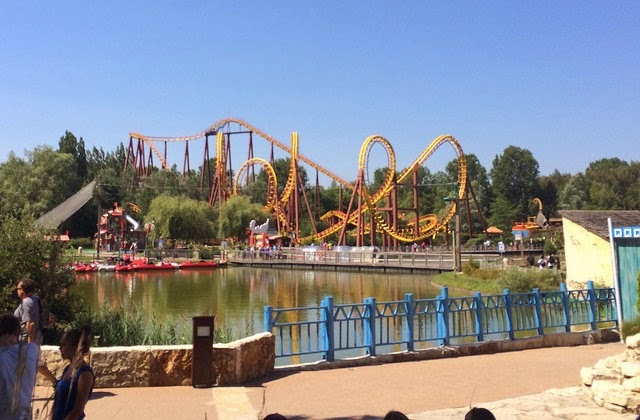 Overall, Parc Asterix is absolutely worth the €32 or even €46 for a one-day ticket but you won't need more than one day at the theme park. 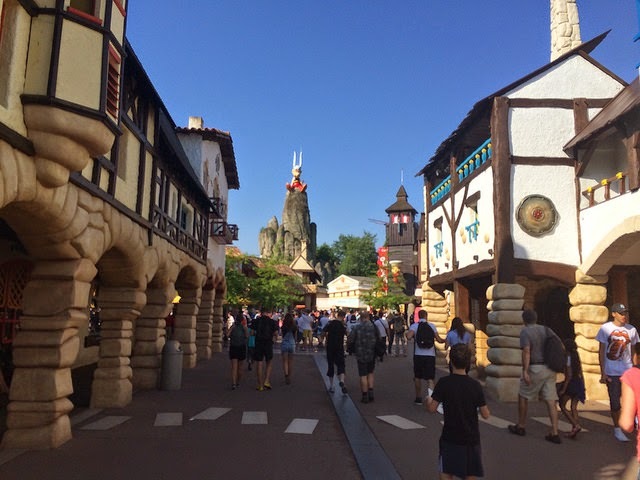 It's not all themed to Asterix which is probably a good thing, it's not coherently themed but the queue lines are relatively short, it has water rides, the staff were friendly enough and it's a change of scenery so if you have time to visit the park on your trip to Paris I highly recommend it. There is an on-site hotel for those who wish to make the most of that. So last month I gave my RIB into service paie to receive my payments straight into my bank account. Unfortunately this didn't happen and I was paid by cheque which are annoying - at least they are credited instantly by my bank. It's getting this credited that's the problem. The bank is closed on Sundays and Mondays, so I had to wait 3 days to get it cashed. Hopefully next month I'll be paid directly. Last time I went for a haircut, I went to Hotel New York and was charged €20 for a haircut - expensive in my opinion. I have now found a better solution. 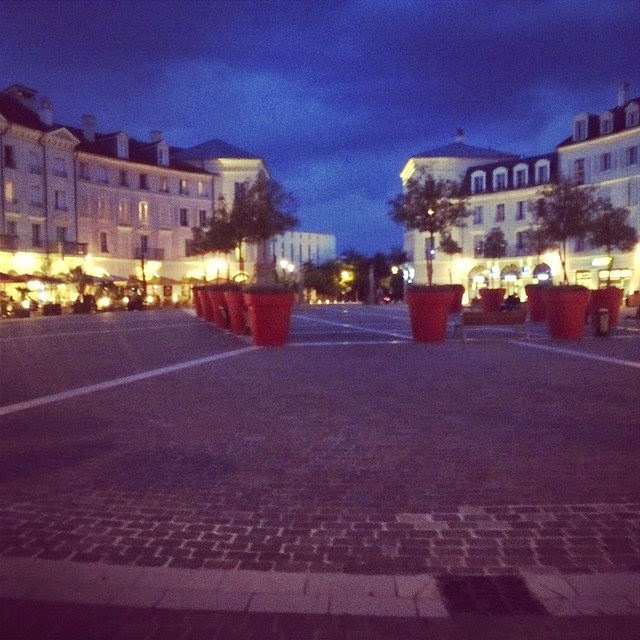 Located just to the right as you come out of the main exit of Val d'Europe RER Station is Tchip. Here for €25 women can get their hair cut and for men the price is only €15. They were really friendly, efficient and responded to my every need (which to be fair isn't much ;). Highly recommended. So housing aid (a.k.a. APL) is still in the process of being sorted. Now apparently I need to send a copy of my birth certificate which they hadn't requested before AND get the housing people to sign a document which as far as I am aware they have already done. Weeks and weeks of waiting only to get this back as a reply. After not having done by medical visit on day 3 of my contract as most people do, I have finally now had my inspection. Took a couple of hours for the whole ordeal which involves believe it or not a urine sample, an audio test, a chat about your medical and work history, a vision test and then getting undressed down to your underwear where the doctor when asks you to do several things and asks if it hurts. I have never seen this before for a job. It was odd to be honest. Apparently these happen every so often to check that our health isn't deteriorating which is a good idea. So, when I was 'checked' Cabane (meaning I can work there), I thought it would never happen but it has actually now been part of the rotation on two occasions. It is a very relaxed position which involves controlling the number of people entering the attraction to make sure there aren't too many. It is possible to get a little queue like up to 5, 10 or even 15 minutes at the attraction. What I do like about the position is that you get to have prolonged conversations with people. What I don't like is how people mess with the turnstiles meaning that if the counter messes up we have to close the tree temporarily. I also don't like how awkward everyone is as they shuffle past the entrance staring it you on your little stool. Nevertheless, it's a relaxed position and you get to sit down which is a bonus. Although we're not *quite* (read: not anywhere near) at Magic Kingdom levels of visitors in the park, the park and the resort is now very busy - finally! It seems like August is when visitor numbers start to boost and almost every day in the last week has been busy. Big Thunder Mountain and Ratatouille both reached 120 minute wait times, our very own Indiana Jones reached 65 minutes, Space Mountain had over 80 minutes wait time, and even Pirates of the Caribbean topped an hour recently. This is all despite temperatures now reaching 22 and 23 degrees instead of the nicer 27 to 30 degrees that it was a month ago. Curious that. Despite how busy the park gets during the day, this is how it looks 30 minutes after Disney Dreams finishes. Stunning. As usual, Disneyland Paris' financial results are not impressing anyone - least of all shareholders. Taking a look at these figures (PDF here) we can see that "third quarter revenues decreased 4% to €340 million and nine-month year-to-date revenues decreased 5% to €873 million". To clarify, the resort made €12.1m LESS in the last three months than it did in the same period last year; for the last 9 months the resort has made €47million less than the same period in the year before. Resort attendance is down 3% compared to last year. All these are for figures up to June 30th, 2014. The next financial figures should be out in November 2014 which will include the summer season - we can only hope these are positive due to the new Ratatouille ride opening. (Side note: Disneyland Paris now has a new CEO - Tom Wolber who will be starting in September and coming over from Walt Disney World. Here's hoping for some positive changes and a return to the US standard of doing things. The probationary period is where both the employer and employee can terminate a contract without needed to give a long notice period. This also means that after the probationary period it is much more difficult to get fired. My 2-month probationary period is up and this is now a secure job. My Birthday and New Year's Eve are set to be spent with my Fantasyland friends Ashleigh and Tori who I worked with at Disney World last year. They're coming over for several days and have their flights booked. 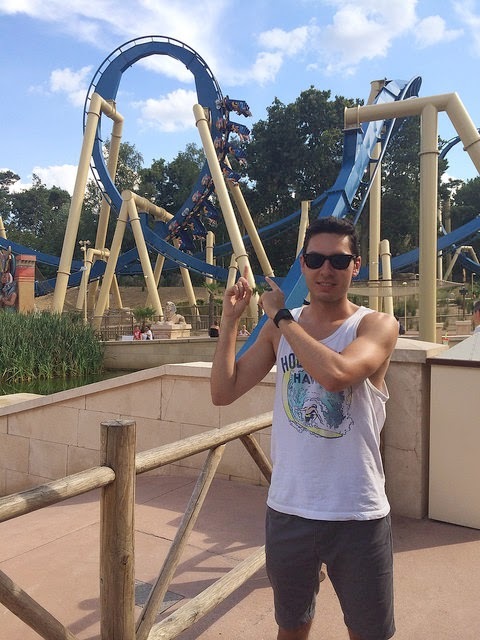 This week on one simple day we stopped four guests who jumped the queue from doing the ride. All we need is for other guests to tell us which they did. As long as we know, we will make sure that queue jumpers won't ride. One even said to me "I'm not going to wait an hour or two for a ride" which just proves how this isn't a one-off incident. After weeks of wanting to go, I finally made it to the Louvre with Lisa who works in boutiques. We only spent a couple of hours there in the end because it was so, so busy. I still think it's somewhere I need to visit on my own too to truly appreciate it and take everything in at my own rhythm. We even went to a book shop where they had books at only 20 cents! Now that's culture! That's it for this instalment. See you soon. 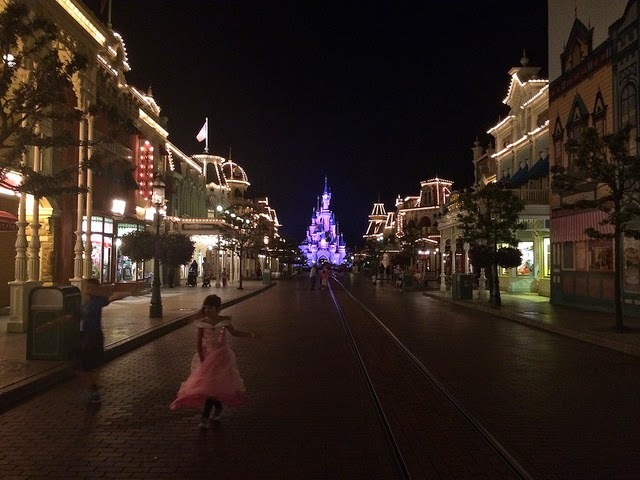 Next Post: Working at Disneyland Paris - Day 71 to Day 126 - Summer is over!